Hey guys, don’t let the women have all the hair coloring fun! Take a look at these color ideas and find something new to try. Switch it up completely or go easy at first with a few highlights or lowlights. If you’re grey and you want to keep it that way, there are color tips here for you too! If you would pull a curtain on this cut it’d be a rollercoaster ride. It starts off with quite the conservatory skin fade and with no warning whatsoever and BAM Lady Gaga! 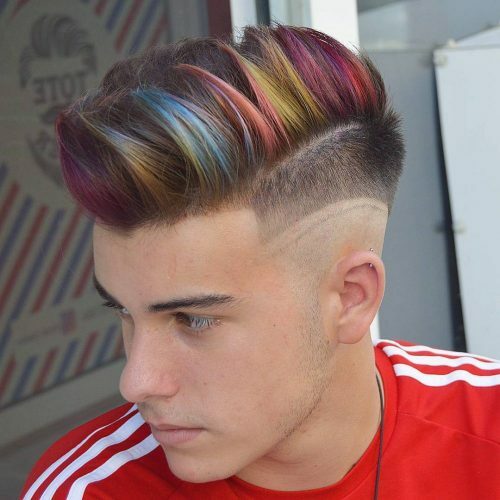 Full bright colors all round on top and wavy free hair. A daring cut, made up of almost all things that make a statement. You get the medium to long hair on the top, pointing daringly upwards, a mix of bright colors and lines on both sides of the skull. For the cool fans of Anime. Big batched pointy spikes, with full thick bodies, all pointed forward and white colored at the top. Something to consider if you’re a t-shirt kind of guy. I would describe this look as something fun and edgy! I love to play with fashion colors, and my inspiration for this look came from video games and anime characters. My favorite thing about this look is the different color tones that pop and how many different looks you can create with the haircut! I personally believe that if someone wants a certain style, they should go for it! Of course, make sure this type of style is right for whatever job you have and be aware of the upkeep it requires. I recommend making sure you have all the right products like a color protector to prolong the vibrancy and anything hydrating to prevent hair from becoming dry. 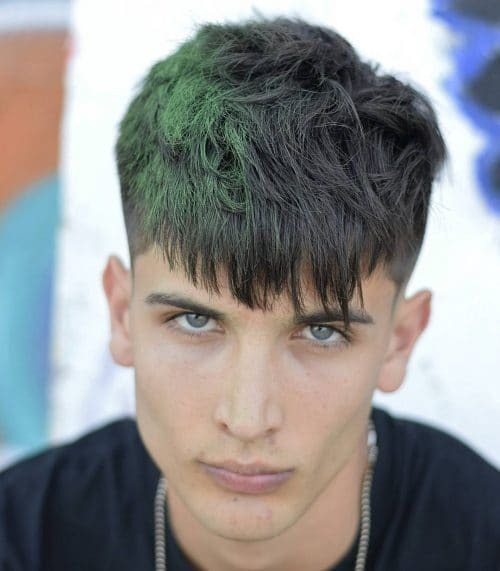 I created this haircut during a street-style photoshoot. Considering the pointed face of the model, I decided to perform a layered round on the top of the head and played a little bit with the movement of the bangs. On the back and on the side of the head, I did a medium fade. I played with the green hairspray on one of half of the head. This look was inspired by the 70s. It showcases experienced weaving with an irregular but controlled result. I recommend this kind of look to everyone, particularly to those who don’t want to spend a lot of time brushing because the look is casual and adaptable. No matter what the hair type, all you need to create this look is a dry effect product. Frizzy or matted hair is actually the best for a cool, messy result. This is a highlighted disconnected combover. What I like most about it is how easy this look is to move around and play with. It looks stylish and works well on just about anyone in a professional or casual setting. A client that is considering this look must have a flexible hair that can be pulled to the back, otherwise, it will fall down. Also, the hair has to be straight or just a bit wavy, but not too curly. 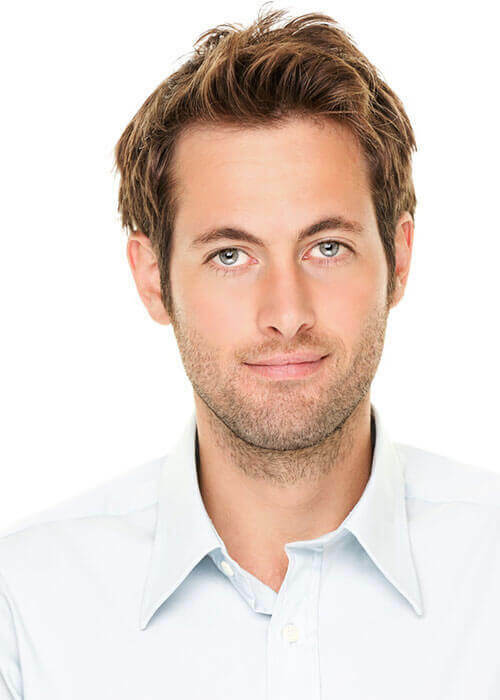 The client needs to know that he will have to use a blow dryer to smooth the hair after washing to give it direction, and will also need to apply a styling product at the end. An appropriate color or highlights will create a shiny, fuller, and edgy effect. This look resembles aged metal. Contrasts emerge in organic patterns and are muted with matte effects. My favorite thing about the look is the reminder of there is beauty in age. As things age, there is more purpose and intent and the mind can appreciate the beauty in simplicity. To give this look a matte effect, I used Sebastian Dry Clean Only and sprayed it into the roots of the hair and massaged it in. This will also allow a client to skip a day of washing their hair, allowing the color to last longer. Men considering this look should express what they would like to see in terms of more than just color. Where do you want the color? How long do you want it? And you willing to give your hairdresser an open mind to design it? This look was created by using Wella Color Create direct dye which shampoos out in 20 washes. 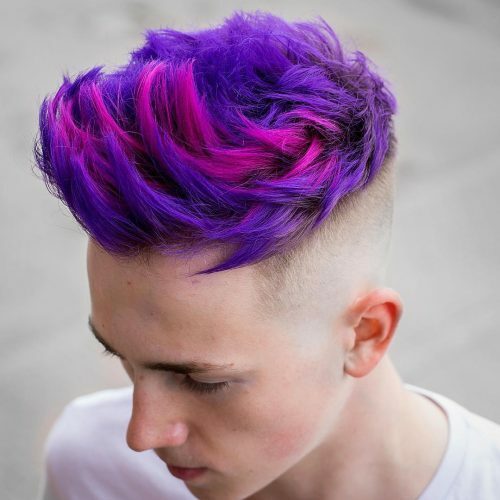 Someone that needs to keep things a bit more conservative can get this color on one side of the head and keep a more natural blonde on the other side. This way they can change their part and in turn, change their color. My client granted me artistic freedom because we were doing a photo shoot. 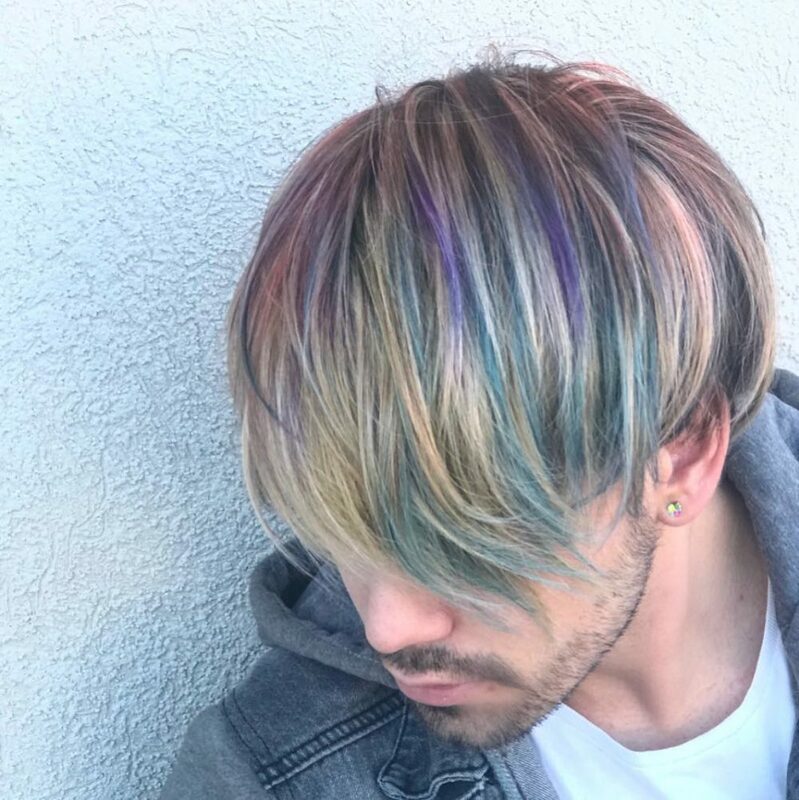 He did express that he was interviewing, so we were cautious on color placement making sure to use the more intense colors at the base of the hair and a softer pastel shade at the ends. The colors are bold but placed in a soft pattern to give a more washed look. It worked because the interviews went well! 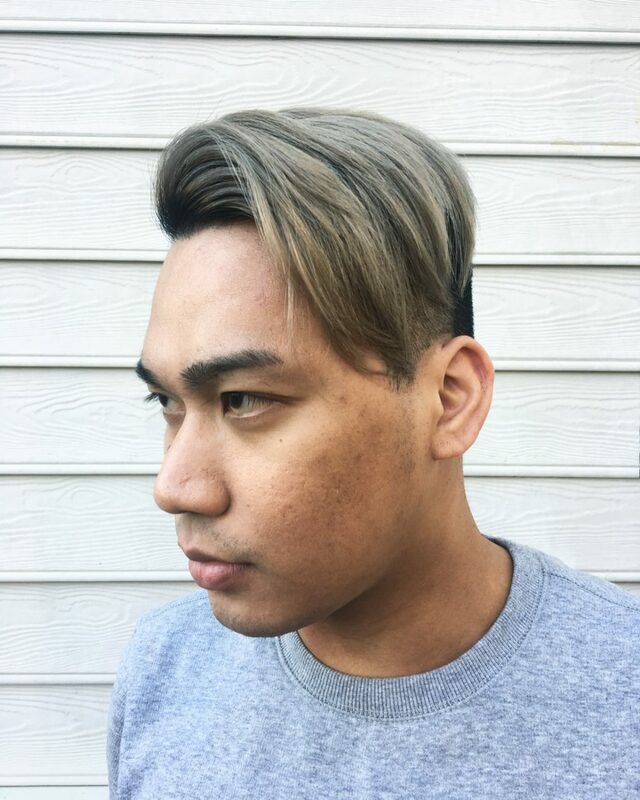 For this look, we bleached his hair and toned it to a slate/smokey grey color. I would describe it as very rugged, burly, and on trend. It’s effortless and simple with a touch of suave. I think of plumes of smoke with the infusion of the color and curls. 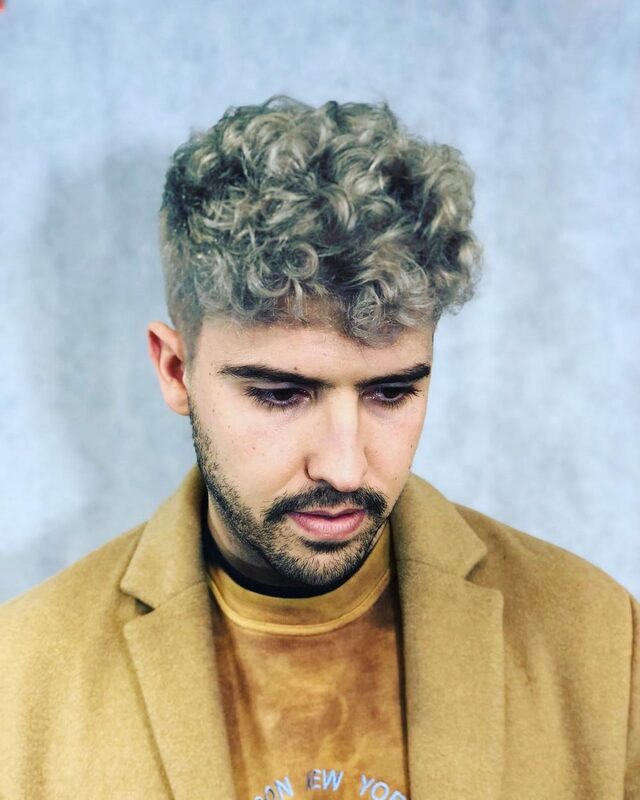 What I love most about this look is that even though the grey can look matte, it still shines almost metallic-like to complement every curl which was diffused. This look is great for the guys who want to completely change their look. This smokey color will fade into a subtle and soft blonde which can create a more undone, rough, and gritty look. Maintaining this look can be easy by using a slate grey shampoo or a platinum blue shampoo. The process is what puts people off. You may not reach the perfect tone in one sitting and it can take a couple of applications to get right. Be patient and it will come! The texture of the hair can change with bleaching, making hard to get that lovely soft finish. Some will find they need to use more oil to get that finish. I recommend Label M Radiance Oil because it works well on most hair types. Guys that go for this look tend to be very fashion-inspired. One alternative for those with a more conservative job or lifestyle would be to place smaller, finer pieces of color. The shades of grey can vary, making it work for a variety of face shapes, hair types, and eye colors. This look is great because it’s on the more natural side of the creative color spectrum. 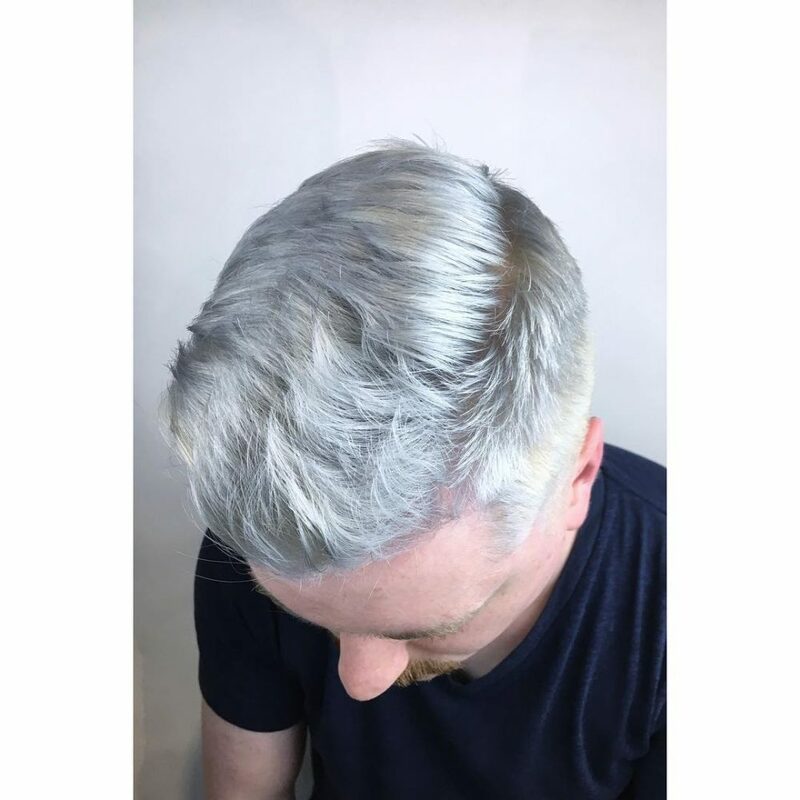 Men looking to explore the fun and creative side of hair tend to lean toward the silver/ashy blonde first rather than diving in head first to bold blues or greens, for example. Creative colors can be difficult to maintain. 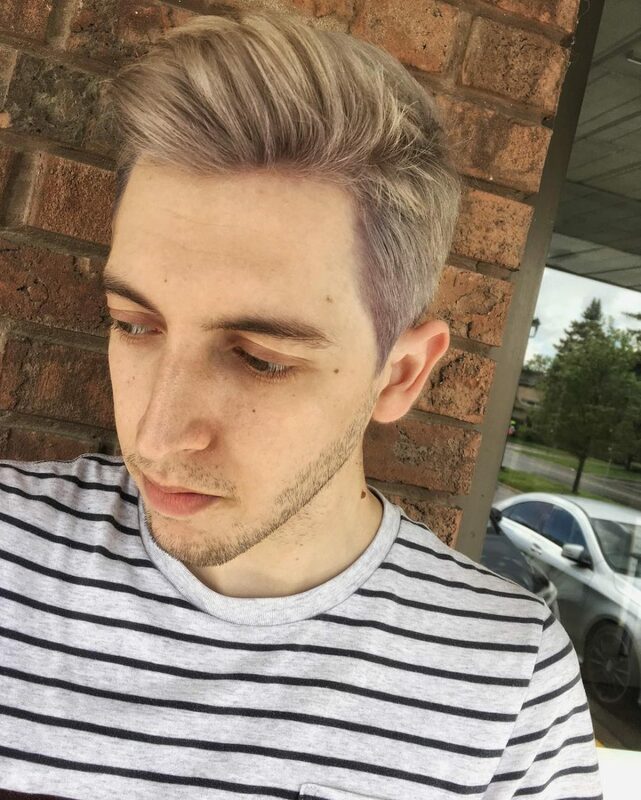 My favorite thing about this shade of blonde is that as the toner begins to fade, he will still be left with a clean, ash blonde! Purple or blue shampoo helps to maintain the ashy tones. My favorite product for blonde hair is Eufora Blonde Color Revive. It is a deep conditioning purple mask that neutralizes any yellow tones in the hair while keeping your hair feeling great! Investing in a good conditioner for at-home care is a must. It is important to keep the integrity of your hair a priority with this color as bleaching can be damaging to the hair. I would not recommend this hair color for people with naturally very curly hair because it is more fragile than any other hair texture and can be easily damaged during the lightening process. The commitment level of this color can either be high to keep up with the regrowth/roots, or it can be low! The great thing about short hair is that if you don’t feel like keeping up with the maintenance of this color, you can easily just cut your hair and it will be cut out in no time. I would describe this look as being very New Orleans boho! My favorite thing about this look is how the bright orange into yellow ties his whole look together. 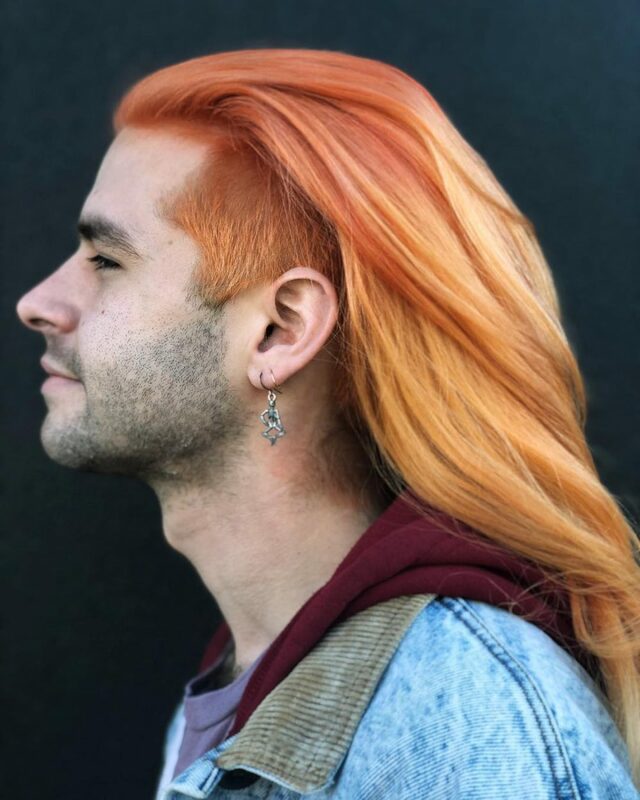 I wanted to give him a lot of dimensions while still keeping it fun, which is why we choose to go for this awesome peach sunset melt. Choose a color fits well with your lifestyle! Your everyday style plays a huge part in what kind of colors will suit you best. If you are a person who wears lots of bright colors, you may want to choose a softer pastel hair color that won’t clash with bolder pieces. Lifestyle is also key in choosing a look that fits you best. People with a more conservative lifestyle may want to slowly introduce color into their look! Starting with some color in your bangs or a section of hair is a great way to see what colors you like best. Hair type plays a big part in how your color is seen as well. For instance, a person who wears their hair curly may seem like their color is darker opposed to someone who wears their hair straight. Straight hair reflects more light which, in turn, typically makes your whole look lighter and brighter! Lastly, the best way to maintain these dreamy, colorful looks is to invest in the right products. Color-safe, sulfate-free shampoos are a must! They lock your color in and keep it from fading when you shampoo. I always recommend Aveda’s Color Conserve shampoo and conditioner to my guests. We also have an amazing product called Daily Color Protect that acts like a raincoat for your hair! It seals everything in and gives a beautiful shine to your color. Fashion colors are a great way to spice up your look and reinvent your style! Life is more fun with COLOR. This look is best described as the trendy silver hipster. 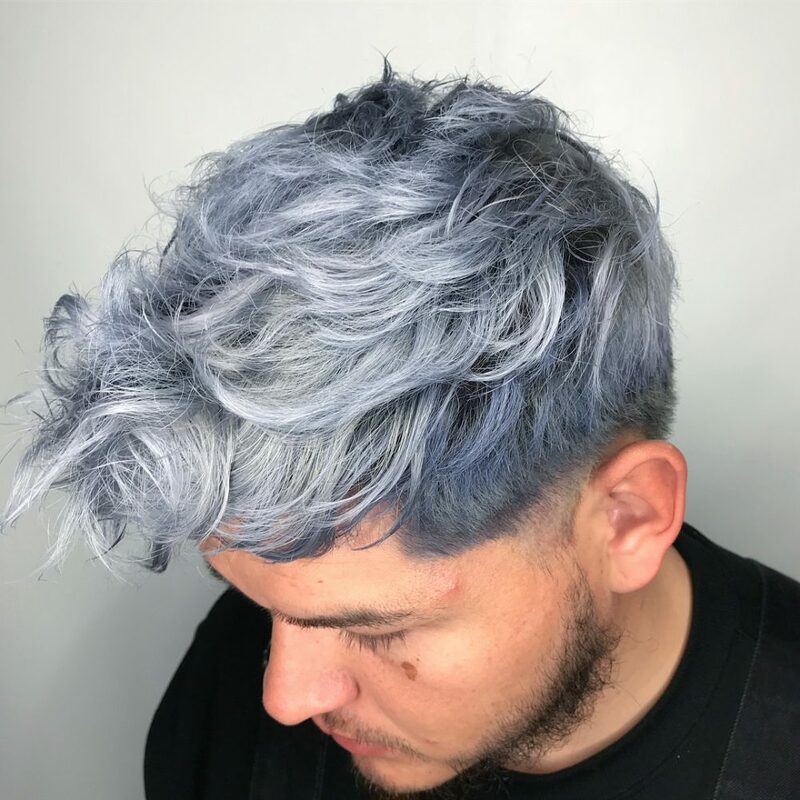 My favorite part of this icy color melted look is the texture I created with his thick and wavy hair. This look is high maintenance! It’s a beautiful color, but you do have to have a strong scalp to be this light. You undergo a heavy lightening session with hair color lightener to lift your hair to almost platinum. I suggest using a deep conditioner and most definitely a purple shampoo. I also recommend a flexible matte pomade to get this messy look. 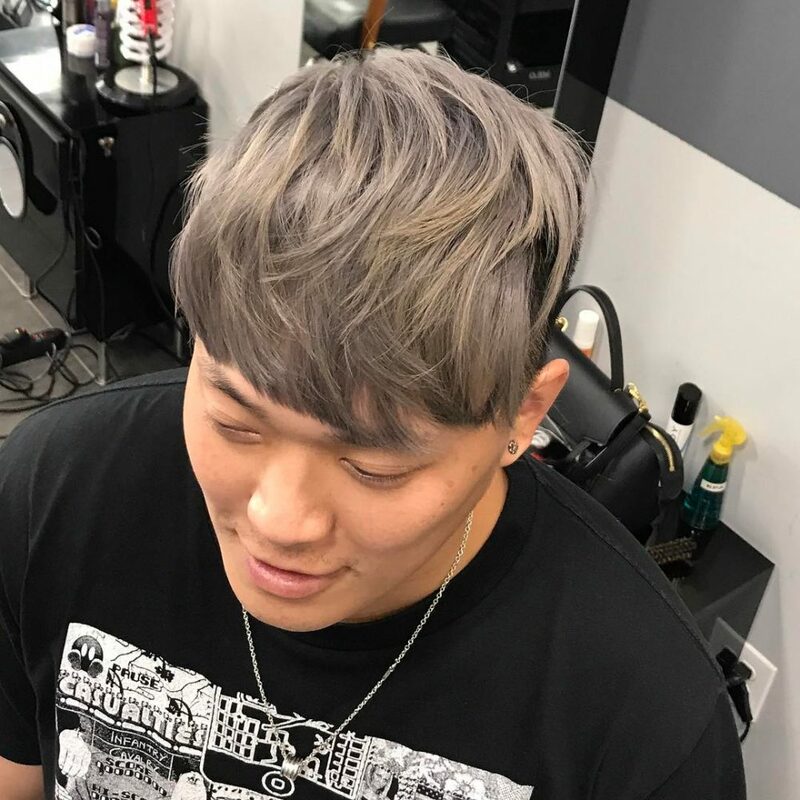 It’s more of an edgy look, so I would recommend this color to someone who is more trendy and fashion-forward that definitely likes to push the limit! This smoky grey color is trendy and fun. 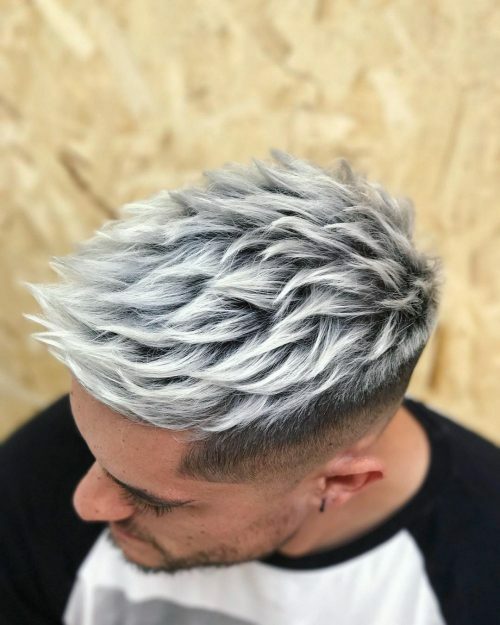 I feel men can go with any type of color, which is my favorite thing about coloring men’s hair. I imagine them coordinating their hair with their daily attire, regardless if it’s a white plain t-shirt or blue jeans or a suit and tie. I love using Eufora products because they are sulfate and paraben-free. I recommend Eufora Moisture Intense shampoo and conditioner, along with their Color Lock. These products will add moisture and shine because they seal the cuticle, keeping the color vibrant for longer. My number one tip for home care is to shampoo and condition your hair every other day with lukewarm water. If you feel that your hair is oily, using dry shampoo helps. You do not want to use hot water because it dries out the hair and makes the color fade faster. Any guy can have this color if they want it. Just be mindful that having this color requires a trip to the salon every four weeks. I would describe this look as fun, adventurous, and edgy, while still looking professional and clean cut. This look can be higher maintenance, or low maintenance when you use it for different types of looks as it grows out Once it grows out a little, it can take on a whole new look with some roots. Dare to be different, change is fun! As for styling, you can keep it professional and neat, or wear it a little messy and textured for a more relaxed and fun style. Play with product and see what fits you! Pomades of all different textures are available. A personal favorite of mine is Redken Rewind. This is a men’s version of the smoky color melts we’ve been seeing a lot on women lately. Don’t let the ladies get to have all the fun! My favorite thing about this look is that it pairs a classic cut with some bold color. It’s unexpected, stylish, versatile, and allows your personality to shine! You can personalize this look with any combination of vivid colors. We kept this one deep with green and blue jewel tones. We pre-lightened the areas we wanted to accent, and deepened the base color with a shade darker than the client’s natural color. This added an intense ash to the base color, keeping the look blended and cohesive with all cool tones. I recommend and use Davines hair color and styling products. They’re eco friendly, sustainable, and plant-based. The color line I use contains no ammonia, which is especially good for guests who have sensitivities or allergies to chemicals. A sulfate-free, color-safe shampoo and conditioner paired with infrequent washing is necessary to maintain the color as vivid colors do fade quickly. For men’s cuts, I always recommend pre-booking an appointment every four to five weeks. The vivid colors will need to be refreshed that often as well to keep it looking bold. My #1 tip for men is to not be afraid to use a blow dryer! Apply a styling cream or volumizing spray after towel drying. Blow dry the top section using a paddle brush to smooth and add volume. Work a clay or pomade into the hair once dry, then brush or finger style into the shape you like. You can finish with a hairspray for increased hold and shine. This look is for the rule breaker, the risk taker, and the rebel. It takes confidence to pull off a bold color and you can expect a lot of attention (especially from women)! This style and cut works well with both fine and thick hair with straight or slightly wavy texture. This look would be very hard to achieve with curly hair. 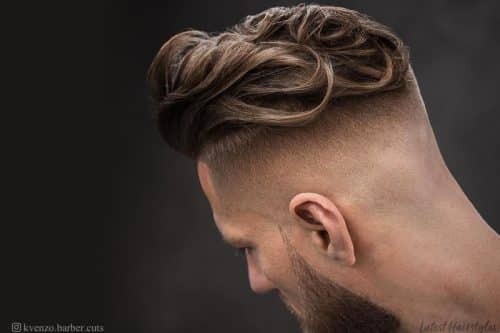 This look takes maintenance both in styling and refreshing the cut and color, so it’s best for the man who visits his salon on a regular basis. I would describe this as a neutral icy silver. It’s on the verge of being cool, but there are only a hint of ashy tones so it’s more silver-grey than a pale blue silver. My favorite thing about it is its neutrality. It is a silver statement without that fashion blue or violet pop that could be over the top. With any blonding like this, Paul Mitchell’s Forever Blonde line is my go-to product to maintain the bright beautiful tones! Silver blonde is a high maintenance color and it requires a healthy canvas to begin. Lightening hair can increase its fragility, so if you have a low natural level, getting to a 9 or 10 (required for this look) can be a journey. You must be a client willing to keep up with the upkeep! Root touch ups and proper products to maintain the tone are both a must. The color can bring out the redness in your skin tone, so be aware of that. I would describe this look as edgy and clean cut. I love that it’s not your typical men’s cut/color and it’s got this client’s personality written all over it. 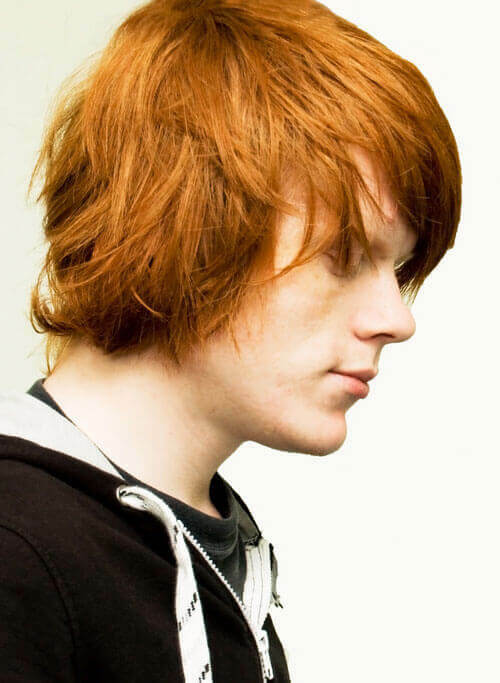 Keeping his hair longer on top allowed for a color that would last longer than three weeks before cutting it out. He will come in for a toner every six weeks to maintain the grey. In addition, he will use the Colorproof violet wash shampoo once a week. On a daily basis, he can blow dry it with a round brush and use Keune Fiber Wax. It shouldn’t take more than ten minutes to style. Having shaved sides allows for a styled look with low maintenance. I recommend this look for someone who wants to have a style for their hair, but doesn’t want to invest too much time into it. This look can be fun but also professional and super versatile, and that’s why I love it. The color adds all the style you need. I would only do this cut on someone with thicker hair to keep the look of the fullness. It is perfect for anyone who likes to get up and go. 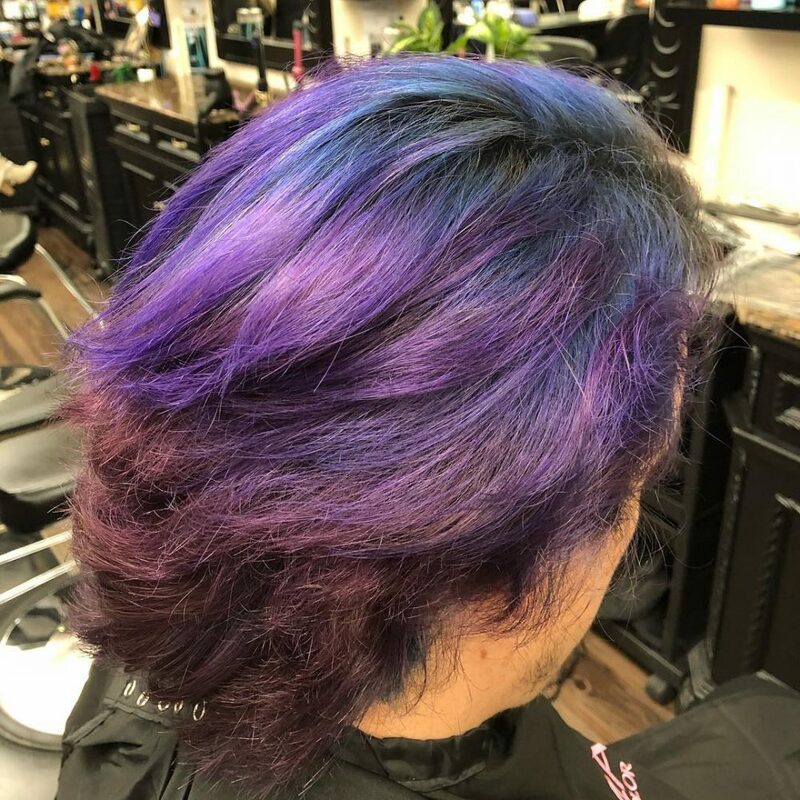 The blue-purple root melt is a fun look for anyone who wants something different. It’s unique and allows you to stand out from the crowd. I love how flawlessly the blue melts into the purple and how easy it is to maintain. 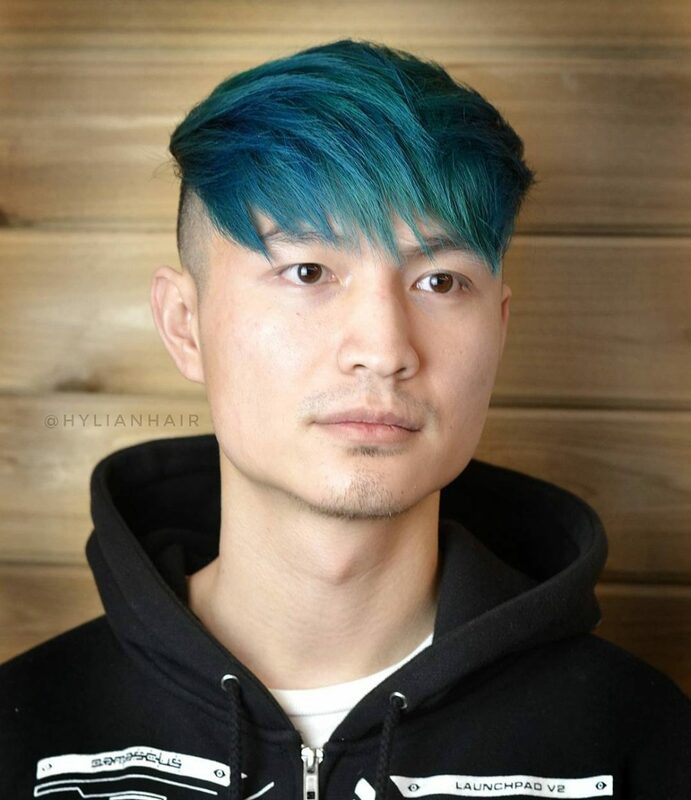 I bleached out the mid-shaft of his hair first with Lanza Healing Color Decolorizer, then used blue and purple vibes Lanza color for the melt. To maintain the look, I sent him home with blue and purple Vivids shampoo. 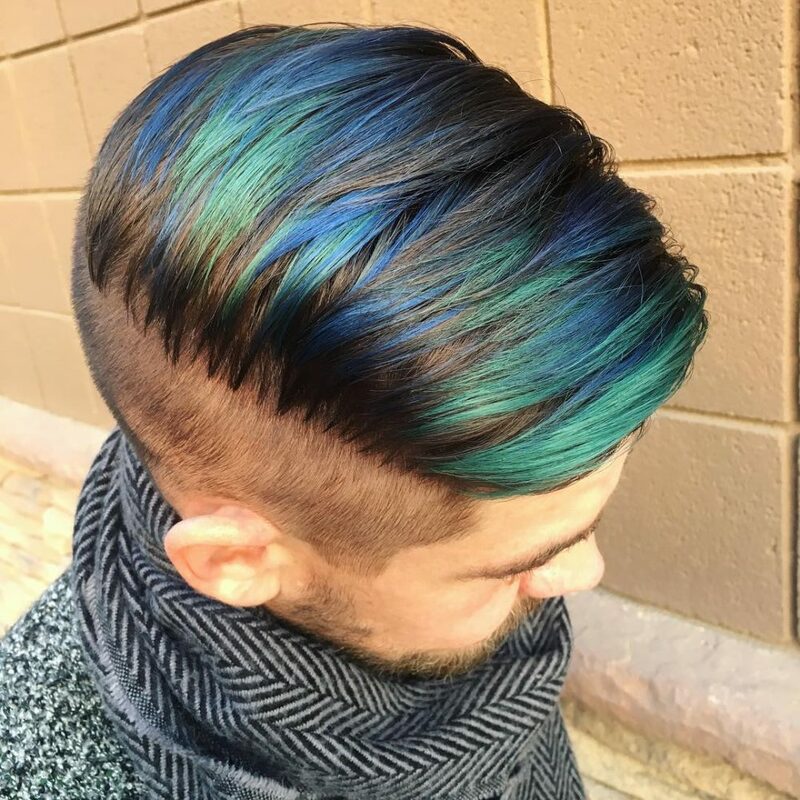 The “peacock” melt looks best on people with a cooler skin tone. It’s high maintenance but is easier to maintain with the Vivids shampoo. I only recommend this to people who are willing to use the shampoos every time they wash their hair. It’s harder to get this look with dark coarse hair but is still possible. It just takes a little bit more time to prevent damaging the hair. People with lighter hair get this look a lot easier with less damage. I 100% suggest this look (or one similar) for anyone wanting something unique that sets them apart from everyone else! The vibrant hue of this copper brown brings out the texture of each curl. Guys with warm skin tones will look great in this color! Warm skin tones contain olive or yellow undertones. This style is perfect if you have naturally curly hair. Anyone with straight hair can wear this color as well but would benefit from a shorter, slightly messy style. Work a bit of curl defining cream through hair after towel drying to keep curls in check. This dark brown color has a hint of caramel, or warmth, as seen in the tips. Get some serious height with this cut and color, which is great on those with olive, yellow and tan complexions. 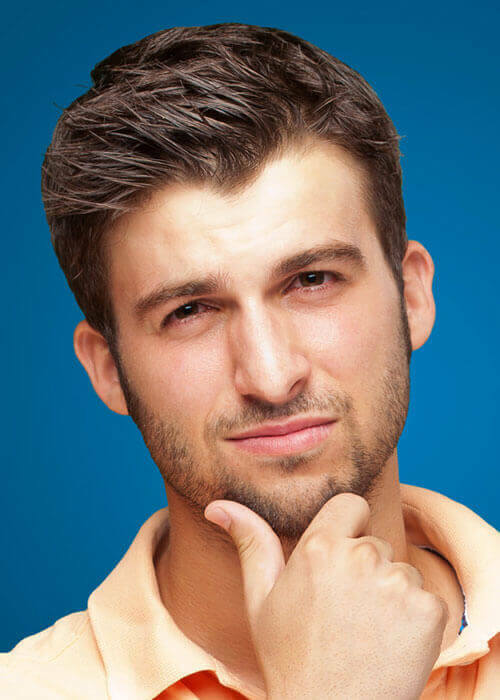 This guy’s hair is on the medium to thick side, which gives the style fullness and movement. Texture spray or wax used on dry hair is the best product for this style! This neutral hue looks great with a style that is short on the sides and slightly longer on the top. Light skinned guys with cool complexions will pull this color off really well! Dark brown eyes will stand out against this color. The ideal hair texture for this style is medium; not too fine or too thick. 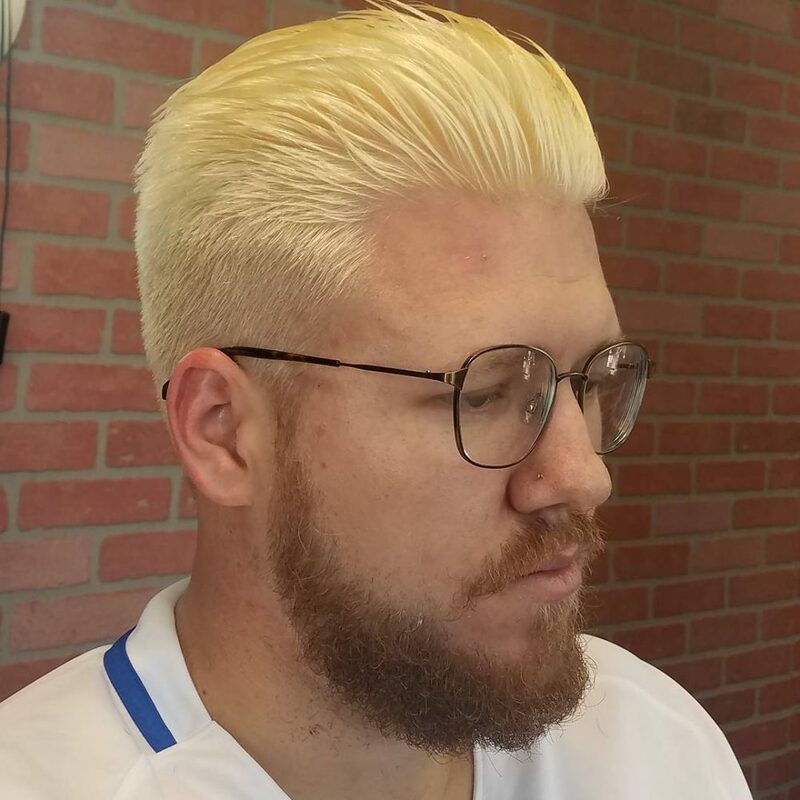 This style was spiked with gel for lift and separation. The dark blonde with a hint of copper seen here is cut close on the sides and left slightly longer on top. Check out this color if you have light skin with slightly warm undertones. This color really brings out blue eyes, which will leave great first impressions! Fine to medium textured hair is perfect for this style. Work a nickel to quarter-sized amount of medium to firm hold style cream through dry hair to achieve this look. How dreamy is this medium, slightly warm brown look worn to just a bit to the side? This hair color looks great against all skin tones! For this style, hair should be thick. If you have fine hair, use a thickening serum to pump up the volume in your hair before applying a styling cream or mousse for hold. For fine or thinning hair, try Nioxin products. They create an optimal scalp environment and provide thicker, denser-looking hair. Caramel tones can be seen throughout this brown color, really giving it some added texture and dimension. Warm tones, such as caramel and others with hints of gold or copper, look fantastic against neutral and warm skin tones. If you have a cool eye color, such as blue or cool green, your eyes will really stand out against this hair hue! 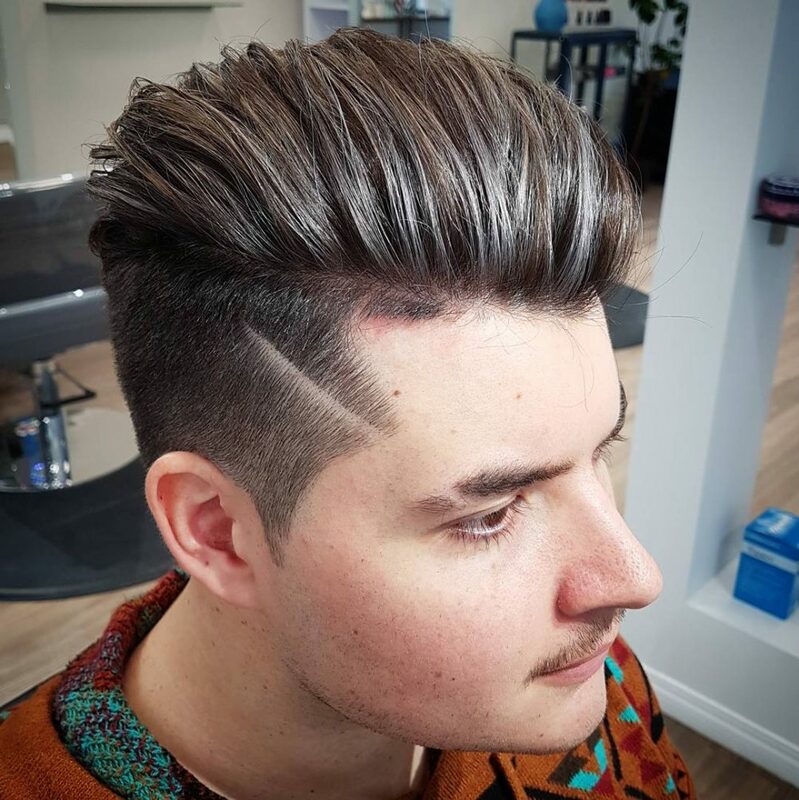 This style can be achieved on those with a medium to thick hair texture by using a bit of ¾ Cream by Gage for Men. Place product on fingertips and work through dry hair. Keep warm browns bright with a gold or copper-based color depositing shampoo. A copper color really complements this shaggy, medium-length layered cut. Try this color if you’ve got a daring streak! It works best on those who have a light to medium complexion with warm undertones. Those with fair skin and a neutral complexion pull this color off really well too. 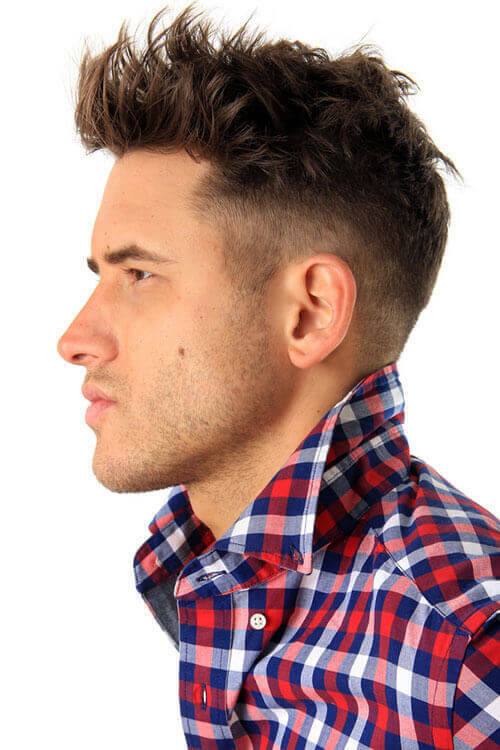 You can easily achieve this style if you have thick hair; just ask your stylist for a razored cut. Bring photos with you when you get a haircut! Descriptions mean different things to different people, so pictures are handy when trying to help your stylist or barber understand what look you’re after. Keep it cool with this short, close-cropped cut that is left a bit longer on top in a deep red tone. Deep, cool reds look great on cool toned fair and medium complexions. Those with darker and slightly warm skin tones can pull this color off too. 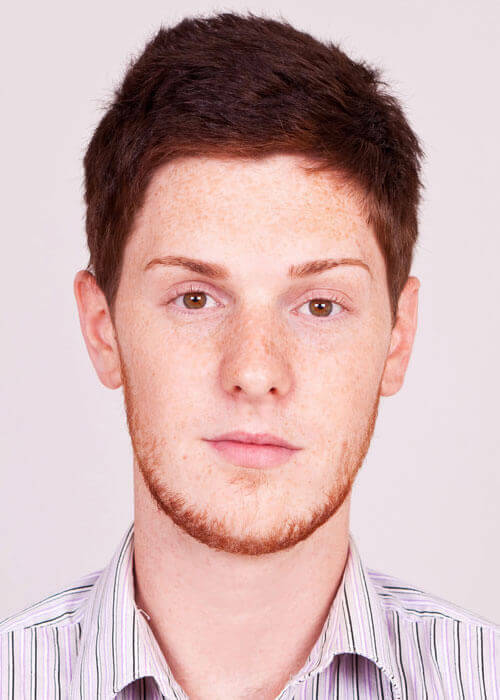 This guy has really thick medium textured hair, which gives a great base for a super short, yet very full, style. Don’t let your hair texture stop you though; reds wear well on any hair type! If you’re not sure which tone of red you’d look best in, consult your closet. If you tend to wear dark red shirts, go for a cool deep red. If you like bright red, then you’re most likely a great candidate for bright reds or reds with hint of copper. Warm things up with a golden blonde hue and an angled fauxhawk. Gold doesn’t have to stay in your jewelry. Golden blonde hair complements fair to medium complexions very well. Usually, those with light eyes are a dead giveaway as being the perfect candidate for this color. 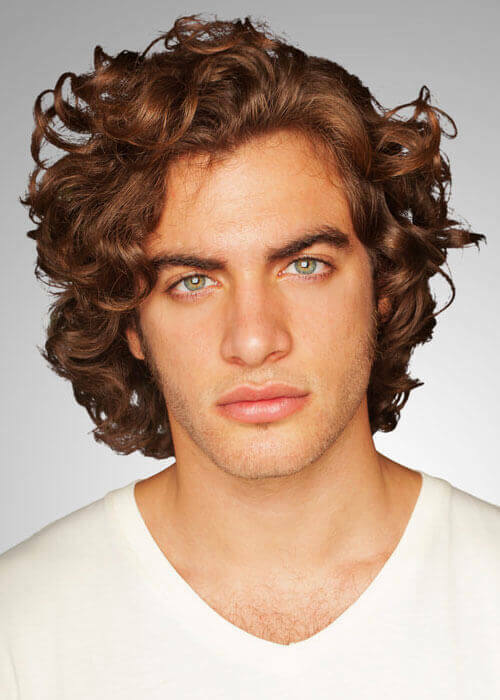 This guy has a slightly wavy thick hair texture, which makes hair easy to style. Use a matte finish styling gel to get this fauxhawk to stand up to the elements all day. A medium brown with golden blonde highlights really enhances the texture of this style. Opt for highlights whether you have natural texture in your hair or not! Highlights will enhance existing texture or add texture to otherwise flat hair. Thick, curly hair is seen here, but those with medium to thick straight or wavy hair can pull this look off as well. The golden blonde tone of these highlights works best on those with medium warm complexions. 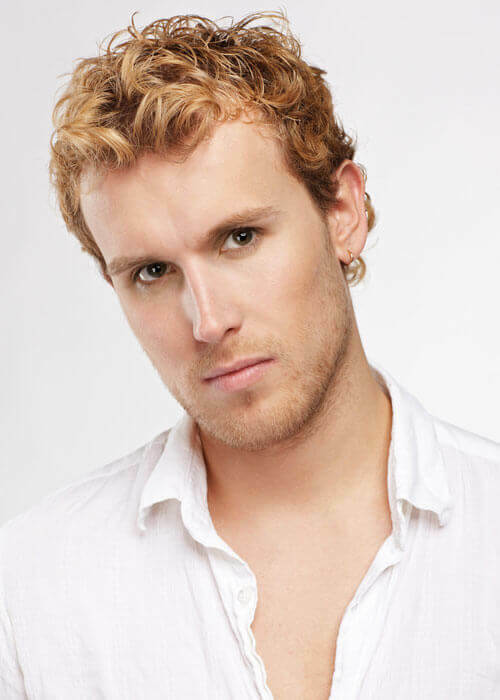 OSiS Twin Curl is a two-phase curl cream that gives definition and a medium hold to curls. Work it through towel dried hair for best results. Mostly dark grey with a little white peppered in, this hair is styled forward and flicked up in front for an edgy feel. This combination of whites and greys is probably the most desired since there’s little white to be seen. If there was color left, it would look almost like a dark brown with highlights, so this grey is worn best by those with medium complexions that have either warm or cool tones. Work a quarter-sized amount of Woody’s Mega Firm Gel through wet or dry hair for the best firm hold you can find. This very deep brown, almost black, hair is styled up and off the face for a cool and professional look. The black-brown hue of this hair color perfectly complements those with medium to deep complexions. The dark nature of this color is best on those with cool or neutral skin tones. This color is great for any hair texture! Those with dark complexions and finer hair will benefit from this dark color since dark hair color has a thickening visual effect. This style was achieved with a firm hold gel on thick hair, but those with fine hair will want to choose a firm hold styling cream with a matte finish. Too much shine can make fine hair look even finer!